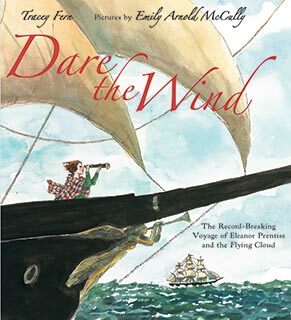 Publishers Weekly: "McCully's (Mirette on the High Wire) signature ink-and-watercolor illustrations bring to vivid life this picture-book biography of sailor Eleanor Prentiss. Dynamic lines and soft hues realistically depict Prentiss's role as navigator aboard her husband's clipper ship, the Flying Cloud, in 1851. Its 15,000-mile maiden voyage around Cape Horn was "racing to get passengers and cargo to the Gold Rush." An anomaly for her time, Prentiss learned the sailing ropes from her ship-captain father. Fern (Barnum's Bones) lyrically paints a picture of the journey's ups and downs, during which Prentiss pushes the ship to its limits with her more scientific, risk-taking navigation style: "The masts creaked and groaned.... Soon every twist of rope and thread of canvas was stretched taut. 'Catch me if you dare!' Ellen shouted to the wind... the sea sparkling green and white around her." From storm-tossed gray-green oceans and the white-icy waters around South America's southern tip to the tilting navigation room belowdecks, the story evokes the daring trip in all its glory, and the many perspectives of the often-majestic scenes bring readers aboard. Ages 5-9. (Feb.)"
From BOOK PAGE: "With a lively and dramatic voice, Fern lays out the perils of the voyage-the ship's mainmast breaks, and Ellen and her crew sail the ship around dangerous waters near the coast of Brazil-and captures the ups and downs of the journey with an almost breathtaking pace. Illustrator Emily Arnold McCully's watercolors move with ease from placid, peaceful waters to angry, churning seas, and her playful lines give readers a solid sense of the thrill of the journey. In one illustration, we're below deck with Ellen, shown with an off-kilter perspective, as if we readers are rocking on the waves with her. Ellen's voyage beat previous records and lasted for three years, according to the informative Author's Note and tips for further reading that close the book. It was a remarkable achievement, especially during a time when a woman navigating a ship was altogether taboo. This is an excellent biography of a record-breaking American sailor."